"I would like to book a private dinner with geisha at my ski lodge. A standard geisha booking fee of 15,000 yen per geisha per hour will apply. This fee does not include dinner or drinks." 5,000 yen per person for a traditional Japanese meal. 6,500 yen per person for a traditional Japanese meal accompanied by premium locally brewed sake. 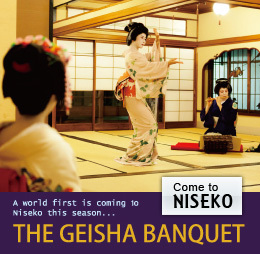 6,800 yen per person for a catered meal prepared and served at your ski lodge by Niseko Gourmet. Wine is paired with the dinner courses and is available at an extra cost. I would like to book a private dinner with geisha in a beautiful traditional Japanese setting in the nearby town of Kutchan. A standard geisha booking fee of 30,000 yen per hour will apply. This fee does not include food or beverages.For 6,000 yen per person, you will be served a traditional Japanese meal and nomihoudai (all-you-can-drink alcoholic/non-alcoholic beverages).